Project kickoffs are a huge opportunity to set a group of people working towards one goal on the right track (or careening down the wrong one). The best way to get everyone on the same page in this meeting? 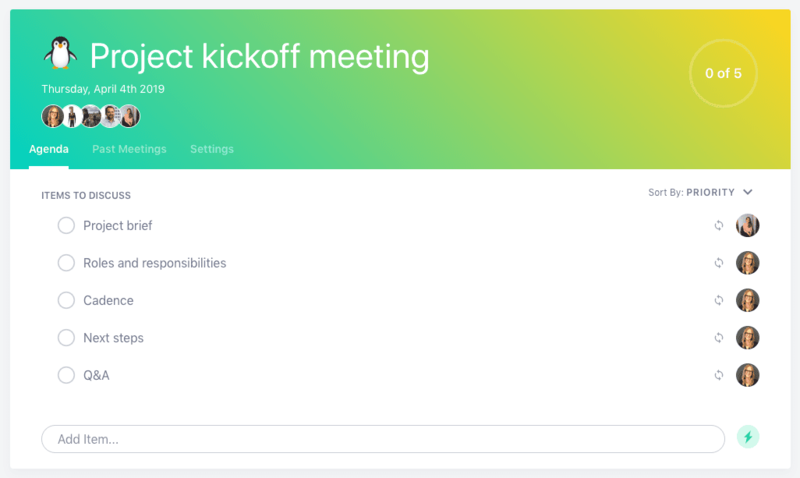 Start with a clear, concise project kickoff meeting agenda. Here are five things to include on your project kickoff meeting agenda. Click here to jump to the SoapBox project kickoff meeting agenda template! Definition: What the project is, and the value it will provide either the business or customers. Goals: What the project is trying to achieve in the long term and short term. Using the OKR (objectives, key results) format is helpful here. SWOT: Strengths, weaknesses, opportunities and threats as they relate to the project. Timeline: When the project should start, when it should be finished, and key milestones in-between. Once you’ve gotten the team up to speed on the project, introduce the roles you’d like each stakeholder to play in the process. Set some guidelines for how often you’ll meet, and how you’ll communicate on and offline. How will you share documents and progress? What medium should you use to communicate? Great, everyone is briefed in, so what’s next? Make sure everyone leaves confidently knowing what to work on and bring to the next meeting. This might mean scoping out the work required, and assigning out tasks. Leave time in your meeting for questions. You want everyone in this meeting to have a clear idea of the project, their role, how to communicate throughout the project and their immediate next steps. If there’s one meeting you want to make sure everyone attends, it’s the project kickoff. There’s way too much valuable information being shared and discussed in a project kickoff to be missing key people. This is a meeting that warrants face-to-face interaction, particularly if your project is taking a quarter or more of time. Is your team remote? Consider arranging an offsite meeting! Inject some fun into your project kickoffs. It might be the first opportunity you’re getting to work with some people in the group and it’s important to start on the right foot. Think about a meeting icebreaker or a short activity as a way to kick things off. When assigning roles and responsibilities for the project, consider using the DACI decision making framework: Driver, Approver, Contributors, Informed. This will be even more helpful when you’re scoping out the project into individual tasks. Project kickoffs, internal or external, go a long way in determining the success of a project. Set a clear precedent in your first project meeting and that tone will carry through the rest of your project management meetings.